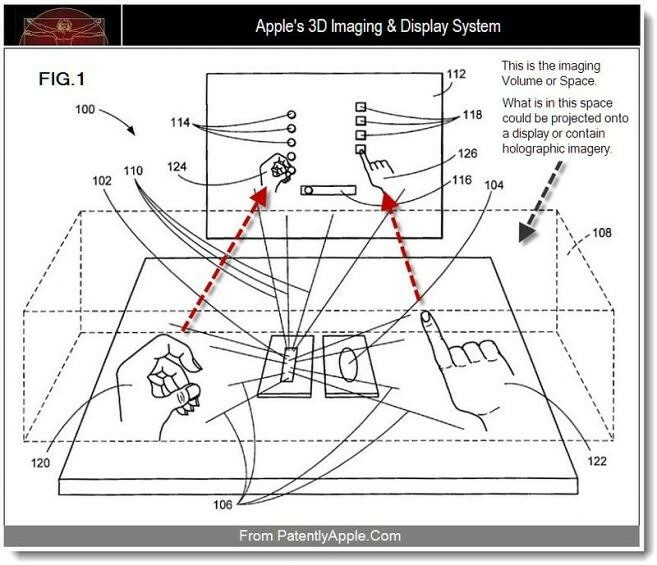 Apple was just granted a patent by the US Patent and Trademark Office (via Patently Apple) detailing 3D display & imaging technologies that could potentially lead to advanced Kinect-like navigation through performing gestures or manipulating holographic images within a virtual 3D space. Essentially, this would allow you to perform hand gestures within a virtual space while your hands are displayed on a screen, allowing for precise manipulation of on-screen elements. The patent’s inventor also notes that these imaging technologies could be used for presence detection, head tracking, and auxiliary display capabilities as well. We can’t help think of Kinect-like gaming for a potential future Apple TV, although the extent of the gestures and tech described in the patent goes well beyond current implementations. As Patently Apple notes, the “virtual elements have no real physical embodiment” but could potentially take advantage of holographic technology that the same inventor outlined in a previous Apple patent. The application could also include audio feedback. For example a clicking sound when pressing a button within the virtual space would provide confirmation of the action. One can only imagine the implications this could have on games and business apps running on a future Apple TV. However, it appears the tech could be used as a global navigation method rather than geared towards a specific application. The patent even touches on potential uses for mobile devices such as an “interactive virtual keyboard” that would detect “finger locations and moves”.